In another sign that the Russian space program was recovering from a decades-long crisis, a new-generation cargo ship flew to the International Space Station, ISS, in November 2008. Modified systems tested during the mission were ultimately designed for Soyuz capsules, which had to carry Russian, American and European astronauts to the completed orbital outpost beginning in 2009. The Soyuz was expected to be the only bridge from Earth to the station during half a decade between the retirement of the Shuttle in 2010 and the introduction of NASA's Orion capsule or an alternative US spacecraft. Russian plans to build a whole new replacement to the Soyuz were also expected to benefit from these latest improvements. In fact, unlike most previous upgrades to the Soyuz, the latest modifications were not dictated by the immediate needs of the program, such as increased crew or taller crew members. Instead, the effort was aimed to build a foundation for more advanced vehicles in the future. Although it looked unchanged on the outside, when compared to its predecessors, Progress M-01M sported a modern TsVN-101 digital flight control system, replacing the obsolete Argon-16 computer which controlled previous ships. Also onboard was the new miniaturized MBITS radio-telemetry system. These upgrades enabled a faster and more efficient flight control system, while at the same time, reducing the overall mass of avionics onboard the ship by 75 kilograms and the number of avionics modules by 15. In addition, the structure of the new control system, the architecture of its software and capabilities, as well as its modular nature, enabled easier adjustment of software to new sensors. 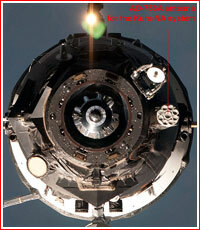 It also facilitated the addition of new objectives and different spacecraft design features. The launch of Progress M-01M had been originally scheduled for Aug. 12, Sept. 10-13 and October 2008. Also, the spacecraft replaced Progress M-66 (No. 366) in the schedule. 2008 Oct. 13-15: Two Soyuz-U rockets intended to launch the Progress M-01M and Meteor-M spacecraft were shipped from their manufacturing plant in the Russian city of Samara to Baikonur Cosmodrome, Kazakhstan. 2008 Nov. 22: The State Commission approved the rollout of the launch vehicle with the cargo ship on Nov. 24, 2008. 2008 Nov. 24: The Soyuz launch vehicle with the Progress cargo ship was rolled out from Site 112 to the launch pad at Site 1 in Baikonur. 2008 Nov. 26, 15:38:36 Moscow Time: The Progress M-01M cargo ship to lift off from Baikonur Cosmodrome. The Progress M-01M cargo ship, carrying 2,676 kilograms of supplies to the station launched on time onboard the Soyuz- U rocket from Baikonur's Site 1 at 15:38 Moscow Time on Nov. 26, 2008, and successfully reached orbit some nine minutes later. Its solar panels successfully opened, however one of two antennas of the Kurs ("course") system, which enables docking of the ship to the outpost did not deploy. According to NASA TV, Russian ground controllers were evaluating the situation. "One of several antennas associated with the Kurs automated rendezvous system apparently did not deploy. The Progress passed out of range of Russian ground stations before all of the data from the initial post-insertion analysis could be received," NASA spokesman John Ira Petty said from mission control. "Russian flight controllers will review data in the hours ahead. They are aiming at determining whether troubleshooting may be required on that antenna. The suspect antenna in question is one of two narrow field proximity antennas used for range and rate updates to the Progress computers through the final stage of its approach for docking at the Pirs Docking Compartment." Around two hours after the Progress launched, Russian ground controllers told the station crew to be prepared to use the manual docking system onboard the outpost, known as TORU, to remotely guide the Progress M-01M to docking, since the probability of using TORU was "high." Mission control in Korolev advised the crew to pay close attention to a special practice session with TORU, which was scheduled on the same day. The actual docking of the vehicle to the station was scheduled for November 30. Around 19:00 Moscow Time, Russian flight controllers reported that the troubled antenna had finally locked in place, after additional commands had been sent to the ship. On November 30, 2008, the Progress M-01M cargo ship was conducting a routine approach to the station, when at the distance of about 15 meters, engineers at mission control in Korolev, Russia, detected some deviations in the performance of the Kurs automated rendezvous system. They instructed the station crew to switch to the TORU remote control system and Russian cosmonaut Yuri Lonchakov then completed the docking manually. Physical contact between the cargo ship and the station's Pirs docking compartment took place at 15:28:10 Moscow Time (12:28:10 GMT), according to the Russian space agency. 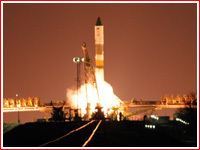 Hatches between the station and the ship were opened around 18:30 Moscow Time (10:30 a.m. EST) on November 30, 2008. The Progress M-01M undocked from the ISS on Feb. 6, 2009, at 07:10:44 Moscow Time (04:10:44 GMT). The braking maneuver to reenter the Earth atmosphere was initiated on Feb. 8, 2009, at 10:32 Moscow Time (07:32 GMT). Remaining debris of the vehicle were estimated to impact the southern region of Pacific Ocean at 11:19 Moscow Time (08:19 GMT). 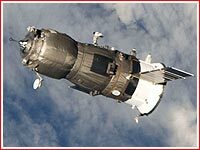 2009 May 7: A second Russian cargo mission guided by digital control departed for the International Space Station. 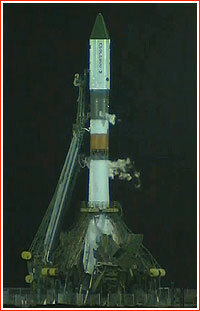 The Soyuz-U launch vehicle carrying the Progress M-02M spacecraft (production No. 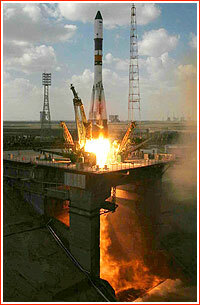 402) lifted off from Baikonur's Site 1 on May 7, 2009, at 22:37 Moscow Time. The 7,119-kilogram vehicle carried 2,259 tons of cargo, including propellant and oxygen. According to the Russian space agency, Roskosmos, Progress M-02M reached its intended orbit. This mission was previously scheduled for April 22, 2009. After a five-day autonomous flight testing its new flight control system, Progress M-02M docked to the International Space Station on May 12, 2009, at 23:24:23 Moscow Time (19:24:23 GMT). The Progress M-02M undocked from from the ISS on June 30, 2009, at 22:29:43 Moscow Time (18:29:43 GMT). The vehicle then remained in orbit for a series of rendezvous tests with a newly activated zenith (upward facing) port on the Zvezda service module. No physical docking of the ship with the port was scheduled. The rendezvous experiment took place on July 12, 2009, at 21:04 Moscow Time (17:04 GMT) when the cargo ship under control of the Kurs automated system approached to a distance of 17 meters from the station. With the experiment successfully completed, the ship was sent away from the station. On July 13, 2009, at 19:43:00 Moscow Time (15:43:00 GMT), the braking engine onboard Progress M-02M was activated for 162.9 seconds initiating its deorbiting. Surviving debris of the vehicle were expected to impact the Pacific Ocean at 20:28:47 Moscow Time at 42º37' South latitude and 140º34' West longitude. 2009 Oct. 15: A Soyuz-U rocket carrying the Progress M-03M cargo ship lifted off from Baikonur's Site 1 on Oct. 15, 2009 at 05:14:37 Moscow Time. The spacecraft carried 2,417 kilograms of cargo to the ISS. The docking of the cargo ship with the Pirs docking compartment of the ISS took place as scheduled on Oct. 18, 2009, at 05:41 Moscow Time. The Progress M-03M undocked from the ISS on April 22, 2010, at 20:32:31 Moscow Time. It then remained in autonomous flight to conduct Radar-Progress and Plazma-progress experiments. The experiment was managed by TsNIIMash research institute, using ground facilities of the Solar and Earth Physics Institute of the Russian Academy of Sciences (Siberian branch) in Irkutsk. The spacecraft was deorbited on April 27, 2010, initiating the braking maneuver at 22:05:00 Moscow Time. The remnants of the vehicle were to impact Pacific Ocean at 22:50:56 at 42 degrees 48 minutes South latitude and 141 degrees 30 minutes West longitude. 2010 Feb. 3: A Soyuz-U rocket carrying the Progress-M04M cargo ship (tail number 404, ISS mission 36P) lifted off from Baikonur's Site 1 on Feb. 3, 2010, at 06:45:29 Moscow Time (03:45:29 GMT). The spacecraft carried more than 2,600 kilograms of cargo to the ISS, according to mission control in Korolev. The mission had been previously scheduled to take off on Oct. 30, 2009. Progress-M04M automatically docked to the aft port of the Zvezda service module on the station on Feb. 5, 2010, at 07:25:58 Moscow Time. 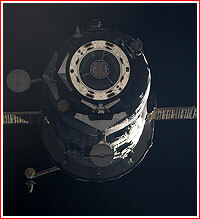 The Progress M-04M undocked from the aft docking port of the Zvezda service module on May 10, 2010, at 14:16 Moscow Time, freeing the docking port for Soyuz TMA-17, which was to be moved from the nadir port of the Zarya FGB control module. The cargo ship was expected to remain in the autonomous flight for a month and a half. In reality, the deorbiting of Progress M-04M was conducted on July 1, 2010. A braking maneuver was initiated at 17:54:00 Moscow Time (13:54 GMT), lasting 150 seconds. At 18:40:55 Moscow Time surviving debris of the vehicle were expected to fall at 38 degrees 16 minutes South latitude and 124 degrees 08 minutes West longitude. 2010 April 28: Only a day after the deorbiting of the Progress M-03M spacecraft, a fresh cargo ship was launched to the station. A Soyuz-U rocket lifted off from Baikonur's Site 1 on April 28, 2010, at 21:15 Moscow Time, carrying Progress M-05M spacecraft. The 7,290-kilogram cargo ship carried 2,588 kilograms of supplies to the station, including some hardware for the MIM1 Rassvet module, scheduled for the launch to the station onboard NASA's Space Shuttle. The cargo ship's payload also included around 420 kilograms of supplies for the US segment of the station. After following an unusually long three-day rendezvous profile with the station to save propellant, the Progress M-05M spacecraft arrived at the Pirs docking compartment of the outpost on May 1, 2010, at 22:30:31 Moscow Time. The docking was completed successfully, however the cargo ship's Kurs automated rendezvous system failed, when the vehicle was around one kilometer from the station. The Kurs system switched itself off, as the vehicle was turning toward the station, following a braking engine firing, while flying tail first. According to an official statement of the Russian space agency, Roskosmos, a problem with the propulsion system of the cargo ship could cause a deactivation of the automated rendezvous mode. The failure prevented Progress M-05M from assuming the correct attitude for docking. As a result, mission control transferred further rendezvous operations to space station commander Oleg Kotov. The cosmonaut used the TORU remote-control system to manually guide the cargo ship to the station without any further problems. The docking of the Progress M-05M to the station was originally scheduled for May 1, 2010, at 22:35 Moscow Time. On Oct. 25, 2010, at 18:25 Moscow Time, Progress M-05M undocked from the ISS. It was expected to remain in autonomous flight for around three weeks for a series of experiment, before a deorbiting maneuver and destruction in the Earth atmosphere. On Nov. 15, 2010, at 11:50:00 Moscow Time (08:50:00 GMT) (one minute later than previously scheduled), Progress M-05M's main engine was activated for 187.3 seconds to initiate a braking maneuver. A 89.8-meter-per-second burn sent the spacecraft into the Earth's atmosphere with an impact point at 48 degrees 03 minutes South latitude and 139 degrees 10 minutes West longitude. Surviving debris of the vehicle were projected to impact the Southern region of the Pacific Ocean at 12:37:02 Moscow Time, (09:37:02 GMT). 2010 June 30: A Soyuz-U rocket lifted off at 19:35:15 Moscow Time from Site 1 in Baikonur Cosmodrome, carrying the Progress M-06M cargo ship (No. 406, ISS mission 38P). In a rare development for Russian cargo ship missions, the docking of the Progress M-06M spacecraft with the International Space Station planned for July 2, 2010, at 20:58 Moscow Time (16:58 GMT) had to be aborted. According to an official statement of the mission control in Korolev, the approach to the station went normally until a distance of around two kilometers, when the cargo ship's automated system issued a command prohibiting further "dynamic operations." As a result, the rendezvous was abandoned. According to NASA, the telemetry between the spacecraft and the station was lost about 25 minutes before the planned docking. Unofficial reports also said that during the original docking attempt, a TV docking monitoring system, the Kurs automated rendezvous system, and the TORU manual remote control system all failed one after another. While the most critical Kurs rendezvous control system was believed to be operational, the flight control system switched off during the rendezvous. During the failed docking attempt, the crew reported seeing uncontrolled tumbling of the cargo ship, as it flew past the station at a distance of around three kilometers. Shortly after the failed docking, Russian officials said that another attempt at docking had been scheduled for July 4 around 20:00 Moscow Time (16:00 GMT). A NASA press-release quoted the new docking time at around 12:17 p.m. EDT. According to NASA, Russian and US space station program managers would discuss the next docking attempt on the morning of July 3. Two Progress engine firings were planned on July 2 and one on July 3 in preparation for the July 4 docking attempt, NASA said. According to mission control in Korolev, telemetry showed that all systems onboard the vehicle worked normally, while ground controllers were analyzing the situation and preparing recommendations for further actions. The spacecraft had enough resources to conduct maneuvers in a new attempt at automated docking, mission control said. On July 3, NASA reconfirmed that the second docking attempt would be made on July 4, this time quoting 12:10 p.m. EDT, as the linkup time. A joint Russian-American meeting approved the decision during a July 3 meeting. As expected, Progress M-06M conducted two engine firings on the night of July 2 (Houston Time) to enter a 300-kilometer orbit and another maneuver was still planned for July 3 to re-initiate the rendezvous between the cargo ship and the station. NASA quoted Russian flight controllers as saying that the command to cancel the July 2 docking attempt was caused by the activation of the TV transmitter for the TORU manual rendezvous system in the Zvezda service module, which interfered with the Kurs automated rendezvous system. TORU serves as a backup docking system, in the event of Kurs failure. Russian officials said the TORU system would not be activated during the July 4 docking attempt, as a precautionary measure. They expressed full confidence there would be no any further issues. NASA said that "overnight" (perhaps referring to the night from July 2 to July 3), Russian specialists had conducted a successful test with both the prime and backup strings of the Kurs automated rendezvous system on both the Progress and Zvezda. Another test of both strings was planned for the night of July 3. A final test of the Kurs system, as is always conducted during the terminal phase of the rendezvous, was to be performed about 50 minutes prior to docking when Progress would be 15 kilometers from the station. In the unlikely event that prime Kurs string of telemetry failed late in the rendezvous sequence on final approach, Kurs’ backup string would take over through docking. If the second string should failed, an automatic abort would be triggered, and Progress would immediately halt its approach and back away from the station to a safe distance. Multiple docking attempts could be made if needed. The Expedition 24 crew members onboard the space station were notified by the team in mission control in Houston that another docking attempt would be made on July 4. They had an off-duty day Saturday, July 3, and were planning to adjust their workday schedule to monitor the docking activities Sunday, July 4, NASA said. During the second attempt on July 4, 2010, the Progress M-06M docked successfully, using the Kurs automated docking system. According to NASA, the most likely cause of the July 2 aborted docking was traced to the activation of the TORU “Klest” TV transmitter, which created interference with TORU itself, causing a loss of the TORU command link between Progress and the International Space Station that triggered the abort of the Progress docking. TORU was not activated for the second attempt, NASA said. The Expedition 24 crew members monitored the arrival of the spacecraft. Progress M-06M undocked from the ISS on Aug. 31, 2010, at 15:21:37 Moscow Time (11:21 GMT). After leaving the station, the vehicle was left in autonomous flight for a series of six experiments known as Radar-Progress and involving ground observations of the vehicle's main engine plume and its interaction with the ionosphere. The Progress M-06M cargo ship was then deorbited on Sept. 6, 2010. 2010 Sept. 10: After a two-day weather delay, Russia launched a new cargo mission to resupply the International Space Station, ISS. A Soyuz-U rocket lifted off on Sept. 10, 2010, at 14:22:57 Moscow Time from Site 31 in Baikonur Cosmodrome, carrying the Progress M-07M cargo ship (No. 407, the ISS mission 39P). The launch vehicle was to follow a standard trajectory to reach a 193 by 245-kilometer orbit with a 51.66-degree inclination toward the Equator. 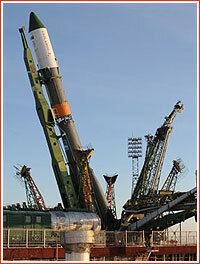 The 7,290-kilogram vehicle carried 2,515 kilograms of supplies to the station. The ship successfully docked with the aft port of the Zvezda service module on the ISS on Sept. 12, 2010, at 15:58 Moscow Time (11:58 GMT) flying under automated control. As of October 2009, this mission had been scheduled to launch on July 27, 2010. Preparations for launch on Sept. 8, were stopped before the fueling of the launch vehicle, due to weather conditions in Baikonur. Strong winds in the area apparently exceeded safety restrictions. Progress M-07M undocked from ISS and was deorbited on Feb. 20, 2011. 2010 Oct. 27: A Soyuz-U lifted off from Site 1 in Baikonur on Oct. 27, 2010, at 19:11:50 Moscow Time (15:11:50 GMT). The vehicle carried the Progress M-08M cargo ship with 2,500 kilograms of supplies bound to the International Space Station, ISS. According to the Russian space agency, Roskosmos, the launch and orbital insertion went as planned. The docking of the cargo ship with the station was scheduled for Oct. 30, 2010, at 20:39 Moscow Time. During the final approach to the station, the cargo ship "experienced some turbulence" in the words of the Russian space agency spokesman. As a result, at a distance of 194 meters from the station Russian cosmonaut Aleksandr Kaleri switched to manual docking with the help of the tele-operator remote control system, TORU. Docking to the Pirs Docking Compartment was then completed successfully at 20:35:43 Moscow Time (16:35 GMT) on Oct. 30, 2010. In the ISS flight chronology the mission was designated 40P. As of October 2009, Progress M-08M had been scheduled to lift off on Aug. 31, 2010. Progress M-08M undocked from the station's Pirs docking compartment on Jan. 24, 2011, at 03:42:43 Moscow Time. The braking engine was activated at 08:16:44 Moscow Time and fired for 155 seconds slowing down the vehicle by 85 meters per second. The remnants of the vehicle were projected to impact the Pacific Ocean at 51 degrees 18 minutes South latitude and 135 degrees 54 minutes West longitude around 09:07:03 Moscow Time. 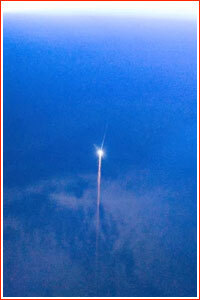 2011 Jan. 28: A Soyuz-U rocket lifted off from Site 1 in Baikonur, on Jan. 28, 2011 at 04:31 Moscow Time. The vehicle carried the Progress M-09M cargo ship (No. 409) with 2,600 kilograms of supplies bound to the International Space Station, ISS. According to the Russian space agency, Roskosmos, the launch and orbital insertion went as planned. Progress M-09M carried 2,600 kilograms of cargo to the ISS, including hardware for experiments Foton-Gamma, Tipologiya, SVCh-radiometriya, Biodegradatsiya and Radioskafandr-V. The docking of the cargo ship with the station took place as planned on Jan. 30, 2011, at 05:38:50 Moscow Time. The spacecraft docked under fully automated control to the station's Pirs docking compartment. In the ISS flight chronology the mission was designated 41P. 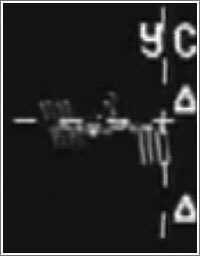 Progress M-09M undocked from the Pirs docking compartment of the ISS on April 22, 2011, at 15:41 Moscow Time (11:41 GMT), the Russian mission control announced. The vehicle was expected to remain in orbit until April 26, 2011, for a series of radar tracking experiments. The spacecraft was deorbited on April 26, 2011. The braking engine was activated at 16:32:00 Moscow Time and burned for 125 seconds. The remnants of the vehicle were calculated to impact the Southern Pacific at 17:22:53 Moscow Time at 38 degrees 54 minutes South latitude and 128 degrees 48 minutes West longitude. 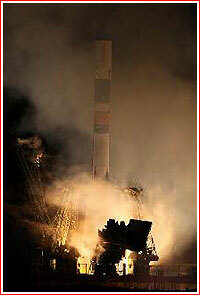 2011 April 27: A Soyuz-U rocket lifted off from Site 1 in Baikonur on April 27, 2011, at 17:05:21 Moscow Time. The vehicle carried the Progress M-10M cargo ship (No. 410) with 2,600 kilograms of supplies bound to the International Space Station, ISS. According to the Russian space agency, Roskosmos, the launch and orbital insertion went as planned. Progress M-10M carried 2,600 kilograms of cargo to the ISS, including hardware for experiments. The docking of the cargo ship with the Pirs docking compartment of the ISS took place as scheduled on April 29, 2011, at 18:28:44 Moscow Time. As of October 2009, the launch was expected on Feb. 9, 2011. The undocking of the cargo ship from the station was planned for Oct. 29, 2011, at 13:04 Moscow Time (09:04 GMT), mission control reported. Progress M-10 was deorbited on the same day, with a 191.4-second braking maneuver starting at 16:10:30 Moscow Time and surviving debris impacting the Pacific Ocean around 17:00:31, at 50 degrees 11 minutes South latitude and 136 degrees 20 minutes West longitude. 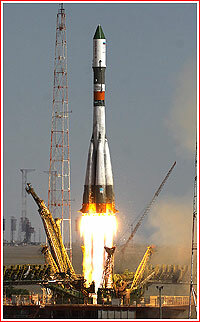 2011 June 21: A Soyuz-U rocket lifted off from Site 1 in Baikonur on June 21, 2011, at 18:38:15 Moscow Time. The vehicle carried the Progress M-11M cargo ship (No. 411) with 2,600 kilograms of supplies bound to the International Space Station, ISS. 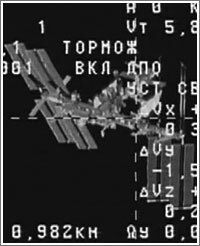 The docking of the cargo ship with the aft port of the Zvezda service module on the ISS took place on June 23, 2011, at 20:37:03 Moscow Time (16:37 GMT). To make room for the next cargo vehicle, Progress M-11M was undocked from the station on Aug. 23, 2011, at 13:37 Moscow Time. Progress M-11M had remained in orbit until Sept. 1, 2011, for the Radar-Progress experiment, mission control said. The 180-second engine firing started at 13:34:31 Moscow Time (09:34 GMT) reducing the vehicle's velocity by 91.8 meters per second and directing it toward reentry over Southern Pacific. According to mission control, remnants of the vehicle were calculated to impact the ocean surface at 14:21:41 Moscow Time (10:21 GMT) at the point with coordinates 40 degrees 8 minutes South latitude and 135 degrees 2 minutes West longitude. 2011 Aug. 24: A Soyuz-U rocket, carrying the Progress M-12M cargo ship bound to the International Space Station, ISS, lifted off from Site 1 in Baikonur into a cloudless sky on August 24, 2011, at 17:00:08 Moscow Summer Time. The separation of the cargo ship from its rocket was expected at 17:09. 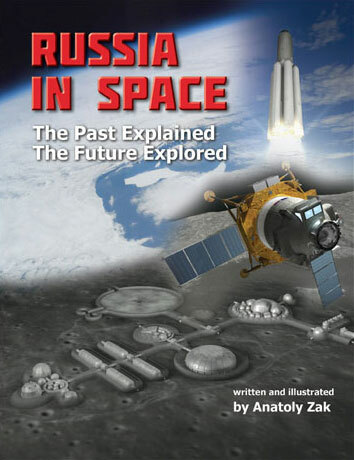 However shortly after the launch, Russian space agency, Roskosmos, announced that a failure of the propulsion system on the third stage of the launch vehicle led to its premature emergency shutdown 325 seconds after a liftoff and the loss of the payload. 2011 Oct. 30: Russia successfully delivered a fresh cargo ship into orbit Sunday, resuming supply missions to the International Space Station after a launch failure in August. The Soyuz-U rocket lifted off from Baikonur Cosmodrome on Oct. 30, 2011, at 14:11 Moscow Time, carrying the Progress M-13M (No. 413) cargo ship. According to the Russian space agency, Roskosmos, the spacecraft reached its orbit as planned and mission control started managing the flight. A docking of Progress M-13M with the station took place as scheduled on Nov. 2, 2011, at 15:41:45 Moscow Time. The cargo ship berthed to the Pirs docking compartment. Along with 2,648 kilograms of regular cargo, Progress M-13M carried a 40-kilogram Chibis-M microsatellite for the Mikrosputnik experiment. The release of the satellite into its 500-kilometer orbit was scheduled from the cargo ship following its departure from the station. Developed by Moscow-based Space Research Institute, IKI and Lebedev Physical Institute, Chibis-M was designed to study physics of atmospheric lightning during a year-long mission. It carried around 12 kilograms of scientific instruments including a gamma-ray detector, UV-detector, radio-frequency analyzer, digital photo-camera and a set of plasma-wave sensors. Ground receiving stations for processing scientific information from Chibis-M were deployed in Kaluga and Krasnoyarsk. 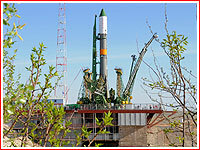 The Progress M-13M mission had to be rescheduled several times in the wake of the Soyuz rocket failure in August, which led to the loss of the previous vehicle. As a result, Progress M-13M has to reach station in order to maintain presence of the crew onboard the ISS. The loading of propellant and gases onboard the vehicle started on Oct. 11, 2011, at Site 31's fueling station in Baikonur. As of October 13, 2011, the delivery of the Block I upper stage for the Progress M-13M and Progress M-14M was scheduled for October 20. The stage was recalled for additional checks in the wake of the Progress M-12M launch failure. Progress M-13M undocked from the Pirs module of the ISS on Jan. 24, 2012, at 02:09:35 Moscow Time. The spacecraft then entered a roughly 500-kilometer orbit for the separation of the Chibis-M satellite. The release of the satellite was to take place on January 25, 2012, at 03:18:30 Moscow Time and, according to mission control in Korolev, the spring-loaded separation of Chibis-M went as planned. After the completion of the satellite launch, the Progress M-13M initiated a deorbiting maneuver on Jan. 25, 2011, at 06:25:00 Moscow Time (02:25:00 GMT). The engine firing lasted 235.3 seconds, slowing down the spacecraft by 125.6 meters per second. The remnants of the cargo ship were calculated to reach remote areas of the Pacific Ocean at 07:17:55 Moscow Time (03:17:56 GMT) at 51.4 degrees South latitude and 128.2 degrees West longitude. 2012 Jan. 26: In its first space launch of the year, Russia successfully sent a cargo ship to the International Space Station, ISS. 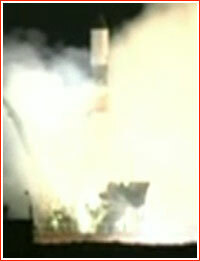 The Soyuz-U rocket lifted off from Baikonur Cosmodrome on Jan. 26, 2012, at 03:06:40 Moscow Time. The launch vehicle successfully delivered the Progress M-14M spacecraft into its initial 190.97 by 261.92-kilometer orbit. The cargo ship carried 2,669 kilograms of supplies to the station. 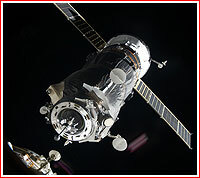 The docking of the vehicle with the station took place as scheduled on January 28, 2012, at 04:08:54 Moscow Time (00:08:54 GMT) under automated control. The cargo ship berthed at the Pirs docking compartment of the station. On April 19, 2012, at 15:04 Moscow Time, Progress M-14M undocked from Pirs, however it was not immediately deorbited in the anticipation of six sessions of the Radar-Progress experiment, which would use ground sensors to observe engine firings onboard the vehicle, Roskosmos said. According to Russian mission control, the spacecraft would remain in orbit for nine days before its deorbiting on April 28, 2012. On April 28, the 191.1-second breaking maneuver was started at 17:47:00 Moscow Time, reducing the vehicle velocity by 93.2 meters per second. The remnants of the cargo ship were calculated to reach the surface of the Pacific Ocean at 18:39 Moscow Time. Russia flawlessly launched a fresh cargo ship to the International Space Station, ISS. A Soyuz-U rocket carrying the Progress M-15M (Tail number 414) spacecraft lifted off from Site 31 at Baikonur Cosmodrome at 16:50:24 Moscow Summer Time (12:50 GMT) on April 20, 2012. Ten minutes after the liftoff, Russian mission control confirmed that the spacecraft had successfully separated from the third stage of the launch vehicle in the initial Earth orbit and its solar panels and antennas had deployed. The 7,290-kilogram cargo ship reached the station two days later, on April 22, and docked to the Pirs Docking Compartment of the station at 18:39:33 Moscow Time (15:39 GMT), just 10 seconds earlier than the time announced before launch. The vehicle carries a total of 2,356 kilograms of cargo for the crew of the outpost, including 648 kilograms of propellant and 420 kilograms of water. 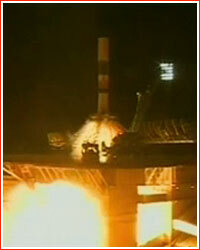 It was the 122nd launch in the ISS project and the 47th Russian cargo supply mission to the outpost. It was also the 5th Russian space launch in 2012 and the second mission for the Soyuz family of rockets since the beginning of the year. After departing the station during the night from July 22 to July 23, 2012, (undocking at 20:26 GMT on July 22; 00:26 Moscow Time on July 23) in the view of Russian ground control stations, Progress M-15M was commanded to start testing of a new rendezvous and docking procedure with the use of a modified Kurs-NA hardware, which had been activated successfully, industry sources said. The cargo ship was to make several maneuvers to separate as far as 160 kilometers from the outpost. Progress would then spend about 27 hours in a station keeping mode. During the final approach, beginning from a distance of 15 kilometers, the vehicle was to be monitored by ground control and a station crew, which had capability to take over the rendezvous process using a TORU remote-control station on the station. A test docking with the station was scheduled for July 24, 2012, at 05:57 Moscow Time (9:58 p.m. EDT on July 23) however at 04:22:04 Moscow Time, as the ship was at a safe distance of 161 kilometers from the station between its second and third autonomous rendezvous maneuvers, the Kurs-NA system generated a command to halt further rendezvous process. Ground control was analyzing the situation, while the Progress was circling the Earth at a 408.1 by 484-kilometer orbit, Roskosmos said. Unofficial reports said that the docking attempt could be repeated as early as July 28 or July 29, soon after the scheduled arrival of the Japanese HTV-3 cargo ship to the station on July 27, 2012. After passing below the station, Progress did conduct two maneuvers which brought into a position above the outpost and enabling another rendezvous attempt on July 29, at 05:00 Moscow Time (evening July 28 Houston Time). However a second attempt to test Kurs-NA two orbits after the overflight of the station was also unsuccessful, industry sources said. 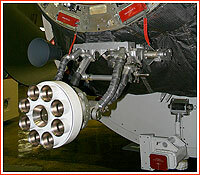 Along with a modified Kurs-NA, Progress M-15M had carried a regular Kurs hardware used for the original docking on April 22, however during the ship's stay at the station on May 29 a Russian cosmonaut Gennady Padalka went into the vehicle, disconnected Kurs and Kurs-NA was brought online instead. Following its second docking to the station, hatches between the vehicle and the outpost were to remain closed. Original plans called for the Progress M-15M final undocking on July 30, at 18:11 GMT, and its participation in the Khlopushka experiment during Aug. 6-14 and Radar-Progress experiment during Aug. 15-20, 2012. By July 26, unofficial but reliable sources said that all attempts to reactivate the Kurs-NA system had failed, while the official Russian media quoted mission control representatives as saying that all information on the testing of the Kurs-NA had been classified. The formal decision on the future course of action was promised on July 27, however it was becoming increasingly clear that the docking with the use of the Kurs-NA system during this mission would not be possible. According to NASA, between five and seven unsuccessful tests of the Kurs-NA were made, despite telemetry data confirming normal operation of all sub-systems. Finally, during the night from July 26 to July 27, mission control succeeded in conducting three test activations of the system, thus clearing the way for another rendezvous and docking with the station on July 29 at 05:00 Moscow Time. On July 28, Russian mission managers also decided that in case of a successful docking to open the hatches between the station and the cargo ship and have the crew to remove the avionics box of the Kurs-NA system in order to investigate the cause of problems during its operation. Due to a considerable size of the system, the station crew was expected to take it apart, so that its key components could be returned back to Earth. According to NASA sources, the problem with Kurs-NA might've been caused by very cold conditions onboard the vehicle and the subsequent thermal conditioning of the ship brought the temperature back to 22 degrees C, thus enabling a normal re-start of the system. In the meantime, in the early hours of July 29 Moscow Time (evening July 28 Houston Time) Progress M-15M made another rendezvous with the station, flew around the outpost and docked successfully to the Pirs docking compartment at 05:00 Moscow Time, thus finally proving the normal operation of Kurs-NA. The final undocking of Progress from the station was initially planned for July 30, at 21:10 Moscow Decree Time, however the operation was then postponed to 00:16 - 00:19 Moscow Decree Time (01:16 Moscow Summer Time) on July 31, 2012.Progress M-15M did undock from the ISS as planned. A fresh cargo ship arrived to the International Space Station, ISS, Wednesday, after trying a faster, shorter trip to the outpost. The launch of the Soyuz-U rocket with the Progress M-16M spacecraft took place as scheduled on Aug. 1, 2012, at 23:35:13 Moscow Time (19:35 GMT; 3:35 p.m. EDT) from Baikonur's Site 1. The cargo ship followed a standard path to orbit before its separation from the third stage of the Soyuz rocket in the initial parking orbit at 23:44:02 Moscow Time. After just four orbits and only six hours after a liftoff, the 7,290-kilogram vehicle with 2.5 tons of supplies successfully docked to the station's Pirs docking compartment at 05:18 Moscow Time (9:18 p.m. EDT on Wednesday) (planned time - 05:24:39 Moscow Time). Normally, Russian cargo and manned transport vehicles spend roughly two days chasing the station. The main goal of this exercise was to certify a shortcut flight scenario for manned Soyuz vehicles, which could start flying along the same trajectory as early as the spring of 2013. A shorter trip to the ISS, would provide more comfort, safety and efficiency for the future station crews facing ever-increasing pace of operations onboard the outpost. The launch of the Progress M-16M (No. 416) from Baikonur was originally scheduled for July 31, at 23:57 Moscow Time, however by mid-May, it was postponed to Aug. 1 to optimse the conditions for the test of a "fast" four-orbit rendezvous with the station. Progress M-16M was undocked from the Pirs docking compartment on Feb. 9, 2013, at 17:15 Moscow Time (13:15 GMT, 7:15 a.m. Houston Time on Feb. 10.) A braking maneuver started at 20:19 Moscow Time with a calculated impact of the vehicle's debris in the Pacific Ocean at 21:05 Moscow Time. A Russian cargo ship made a successful one-day trip to the International Space Station, ISS, on October 31, 2012. A Soyuz-U rocket carrying the Progress M-17M (No. 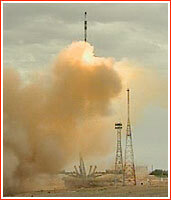 417) spacecraft lifted off from Baikonur at 11:41:18 Moscow Time (07:41 GMT). It carried 2,400 kilograms of supplies for the crew of the orbital station. Following a four-orbit rendezvous profile, first tried during a previous mission, Progress M-17M successfully docked to the Zvezda service module within the Russian segment of the outpost at 17:33:46 Moscow Time (13:33 GMT). During the preparation of the mission, on October 26, a fully assembled payload section was shipped from the processing area at Site 254 to a vehicle assembly building at Site 112 for integration with its Soyuz-U rocket. Speaking at the expanded meeting of the company's management on November 16, 2012, the head of TsSKB Progress Aleksandr Kirilin disclosed that engineers had discovered anomalies in the performance of the third stage engine, which had to be analyzed. 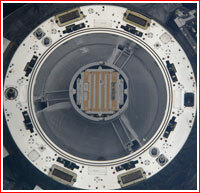 Progress M-17M departed the aft docking port of the Zvezda service module on April 15, 2013, at 16:02:36 Moscow Time. The spacecraft was scheduled to remain in orbit for six days for ionospheric experiments involving its engine firings and activation of the UHF-transmitters of the TORU remote-control system, as well as ground radio-tracking hardware. On April 21, 2013, at 18:10 Moscow Time, the main engine onboard Progress M-17M was activated for 173 seconds, reducing the velocity of the vehicle by 90 meters per second. The maneuver sent the spacecraft toward reentry with a projected impact of surviving debris in the Pacific Ocean at 51.5 South latitude, 128.1 West longitude, mission control announced. A Russian cargo ship arrived at the International Space Station, ISS, opening a flow of supplies to the orbital outpost in 2013. The launch of the Soyuz-U rocket from Site 1 in Baikonur took place as scheduled on Feb. 11, 2013, at 18:41:47 Moscow Time (9:41 a.m. EST). 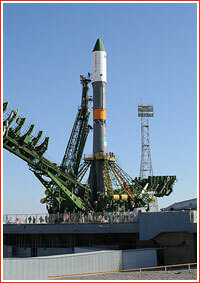 The rocket was carrying the 7,290-kilogram Progress M-18M cargo ship (production No. 418). It will be the first mission heading to the ISS in 2013. The launch vehicle followed a standard ascent trajectory to enter an initial Earth orbit, which was reached successfully. In preparation for the arrival of fresh supplies, a previous cargo ship -- Progress M-16M -- was undocked from the station's Pirs docking compartment on the Russian segment of the station. Progress M-18M undocked from the ISS on July 26, 2013, at 00:44 Moscow Time. A pre-programmed braking maneuver was initiated on the same day at 03:53 Moscow Time. After 198 seconds of firing, it reduced orbital velocity of the spacecraft by 106.4 meters per second, sending it to a reentry over the Pacific Ocean. Surviving debris were calculated to impact at 51.7 South latitude and 132.7 West longitude at 04:42 Moscow Time. Along with other discarded items, the spacecraft carried an old treadmill from the Zvezda service module of the station. 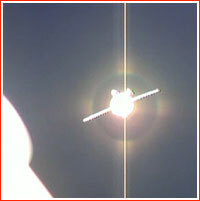 Russia launched a second supply ship of 2013 to the International Space Station, ISS. The launch of the Soyuz-U rocket from Site 1 in Baikonur took place as scheduled on April 24, 2013, at 14:12:16 Moscow Time (6:12 a.m. EST). The liftoff of the Soyuz-U rocket from Site 31 in Baikonur took place as scheduled at 00:45:08 Moscow Time on July 28, 2013, (4:45 p.m. EST on July 27), as the ISS was flying over Southern Russia near Mongolian border. A Russian cargo ship was launched to the International Space Station, ISS. A Soyuz-U rocket carrying the 7,290-kilogram Progress M-21M (No. 421) spacecraft lifted off from Pad No. 6 at Site 31 in Baikonur Cosmodrome on Nov. 26, 2013, at 00:53:06 Moscow Time (20:53:06 GMT, 3:53 p.m. EST on November 25). The docking of the spacecraft with the station is scheduled for Nov. 30, 2013, to give the engineers time to test a lighter and more accurate version of the rendezvous system known as Kurs-NA, before it could be certified for use onboard manned Soyuz spacecraft. The launch was previously scheduled for July 30 and Oct. 16. On November 28, from 00:45 to 02:47 Moscow Time, Progress M-21M conducted a successful test "flyby" of the station with the use of Kurs-NA, approaching the station to a prescribed distance at 01:48:57 Moscow Time. However the spacecraft then looped above and behind the station at a distance reaching more than 100 kilometers before its return and scheduled docking on November 30. On Nov. 30, Progress M-21M conducted a second automated rendezvous with the aft docking port on the Zvezda service module, using a new Kurs-NA system, which performed normally until a distance from 60 to 30 meters, according to various sources. Then, the system detected a mismatch between estimated and measured parameters and left the spacecraft in stand by mode near the station. In order to save the propellant onboard the vehicle, mission control advised the crew to use manual remote control system, TORU, to dock the vehicle, which was used successfully by Oleg Kotov. The docking took place during the cargo ship's 65th orbit, at 02:30:20 Moscow Time (5:30 p.m. EST on November 29), around two minutes behind schedule. The opening of hatches between the station and the cargo ship was scheduled two hours and 15 minutes after docking. Along with routine supplies reaching 2,400 kilograms, Progress M-21M delivered remote-sensing camera built by a Canadian company UrtheCast. The device was to be installed on the exterior of the station. On April 23, 2014, Progress M-21M undocked from the station for another test of the modified Kurs-NA rendezvous system. It used Kurs-NA to redock to the station on April 25, 2014. Progress M-21M undocked from the Zvezda service module of the ISS on June 9, 2014, at 17:30 Moscow Time and three minutes later fired its thrusters to increase its distance from the station. The braking maneuver to reenter the atmosphere was initiated as planned at 20:34 Moscow Time on the same day. The ship's surviving debris were expected to impact in the Southern Pacific Ocean around 21:23 Moscow Time. The launch of the Soyuz-U rocket from Pad No. 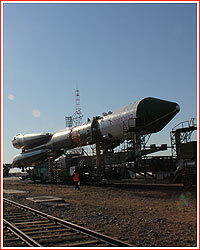 5 at Site 1 in Baikonur took place as scheduled at 20:23 Moscow Time (11:23 a.m. EST). The launch vehicle was carrying the Progress M-22M (No. 422) cargo spacecraft with 2.5 tons of cargo for the orbiting outpost and its 38th long-duration expedition. Among unusual payloads onboard the ship, is a container with gold fish for the Russian-Japanese Akvarium-AQH experiment. In the ISS schedule, this mission was known as 54P. Russia launched a second unmanned supply mission to the International Space Station, ISS. The liftoff of a Soyuz-U rocket took place as scheduled on April 9, 2014, at 19:26 Moscow Time (11:26 EST) from Baikonur's Site 1. The launch vehicle was carrying the 7,290-kilogram Progress M-23M (No. 427) cargo ship with 2,383 kilograms of supplies and consumables for the orbiting outpost. The docking of the spacecraft with the station's Pirs docking compartment (SO1) is scheduled around six hours after launch at 01:20 Moscow Time on April 10 (4:20 p.m. EST on April 9). The actual docking was successfully accomplished in automated mode at 01:14 Moscow Time on April 10. Progress M-23M undocked from the ISS on July 22, 2014, at 01:44 Moscow Time. It was deorbited on Aug. 1, 2014, with an estimated splashdown of surviving debris at 02:42 Moscow Time. Russia sent fresh supplies to the crew of the International Space Station, ISS. The liftoff of a Soyuz-U rocket from Site 1 in Baikonur Cosmodrome took place as scheduled on July 24, 2014, at 01:44:44 Moscow Time (5:44 p.m. EDT on Wednesday, July 23). The launch vehicle was carrying the Progress M-24M (No. 424) cargo ship bound to the ISS. The spacecraft was loaded with 2,600 kilograms of cargo for a six-member crew of the orbital outpost. Progress M-24M docked at the Pirs docking compartment (SO1), a part of the Russian segment of the ISS, within a minute from a scheduled time of 07:31 Moscow Time on the same day (11:30 p.m. EDT on Wednesday). Progress M-24M undocked from the Pirs docking compartment (SO1) on Oct. 27, 2014, at 08:38 Moscow Time. It was scheduled to remain in orbit until Nov. 20, 2014. From Nov. 2 until Nov. 19, 2014, ground control planned to use the spacecraft for the Otrazhenie ("Reflection") experiment. A braking maneuver onboard Progress M-20M was initiated on Nov. 20, 2014, at 02:00 Moscow Time. The engine was firing for 186 seconds reducing the spacecraft's velocity by 106.88 meters per second. The ship's debris were calculated to fall at 42.7 degrees South latitude and 141.4 West longitude at 02:46:04 Moscow Time, mission control said. A fresh cargo ship rode a Soyuz-2-1a rocket for the first time Wednesday, marking a milestone in gradual adoption of modified launch vehicles for the human space flight. A fresh cargo ship rode a Soyuz-2-1a rocket for the first time Wednesday, marking a milestone in gradual adoption of these modified launch vehicles for the human space flight. The launch and docking of the Russian Progress craft went without a hitch just hours after an Antares rocket powered by the Moon Race-era Soviet engines and carrying a Cygnus cargo ship bound to the ISS had exploded at launch over the Wallops Island off the cost of Virginia. The liftoff of the Soyuz-U rocket took place as scheduled on Feb. 17, 2015, at 14:00:17 Moscow Time (6:00 a.m. EST, 11:00 GMT) from Pad No. 5 at Site 1 in Baikonur. The launch vehicle carried the 7,287-kilogram Progress M-26M spacecraft bound to the International Space Station, ISS. Following a standard ascent, the spacecraft separated from the third stage of the launch vehicle at 14:09:06 Moscow Time (6:09 a.m. EST, 09:09 GMT) in a 192.7 by 246.3-kilometer orbit with an inclination 51.65 degrees toward the Equator, the mission control in Korolev confirmed. The launch of the unmanned Progress M-28M spacecraft (Mission 60P to the International Space Station, ISS), on July 3, 2015, marked the return to flight of the Russian cargo ship series after the failure of a previous mission on April 28, 2015. The resumption of Progress flights acquired even more significance after the loss of NASA's Dragon SpX-7 unmanned carrier in the failure of a Falcon-9 rocket on June 28, 2015. A Soyuz-U rocket with the Progress M-28M spacecraft lifted off on July 3, 2015, at 07:55:48 Moscow Time (12:55 a.m. EDT) from Pad No. 5 at Site 1 in Baikonur Cosmodrome. The liftoff of the Progress M-29M spacecraft took place as scheduled on Oct. 1, 2015, at 19:49:40.648 Moscow Time (12:49 p.m. EDT) from Pad No. 5 at Site 1 in Baikonur. The 7,290-kilogram cargo ship rode the Soyuz-U rocket into orbit. Following the vertical liftoff, the launch vehicle headed eastward from Baikonur to match an orbital inclination of 51.66 degrees. The spacecraft was to separate from the third stage of the launch vehicle into a 193 by 245-kilometer parking orbit at 19:58:29.18 Moscow Time (12:58 p.m. EDT). According to the Russian mission control in Korolev, the actual parameters of the initial orbit were 193.77 by 246.34 kilometers. Progress M-29M was the final vehicle in the Progress MM series, to be replaced by a new variant designated Progress MS.
SIGN UP FOR A REPRINT!